It is now 8:54 PM ET Time on Sunday, April 21, 2019. Relay Online Registration closed at 11:59 PM on Tue, Sep 26, 2017. On June 22, 2014, the swimming community mourned the loss of a great friend and competitor, Chris Clarke. 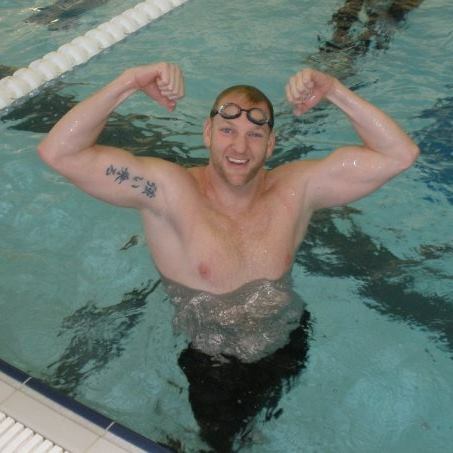 Chris was participating in the 1st Annual Indy Open Water Challenge when he was pulled from the water. Words simply could not express the depth and magnitude of grief felt by his Indy Aquatic Masters teammates and his friends in the greater swimming community. Anyone who knew Chris felt his enthusiasm for life and his passion for swimming. Now, with the blessing of his family, we celebrate his life and enthusiasm for our sport through the Chris Clarke Invitational Presented by Runners Forum. We are thrilled that this year's meet will also serve as the Great Lakes Zone Championship. We look forward to seeing you all in Indy! LOCATION: IUPUI Natatorium, 901 West New York Street, Indianapolis, IN 46202. Parking is available in the adjacent garage. FACILITY: The iconic IU Natatorium is located on the campus of IUPUI and has been a fixture in the community since 1982. The IU Natatorium has hosted hundreds of state, regional, national, and international events, including 13 Olympic Trials. Having just undergone an extensive renovation, the IU Natatorium is poised to be at the forefront of high-level competitive swimming for years to come. POOL: The pool will be set up as one 25-meter course for competition and a 25-yard warm-up pool. The length of the competition course is in compliance and on file with USMS in accordance with articles 105.1.7 and 107.2.1, but as a bulkhead course, is subject to length confirmation. Eligibility of times for USMS Top 10 and Records will be contingent on verification of bulkhead placement. RULES: Current 2017 U.S. Masters Swimming rules will govern the conduct of this meet. ELIGIBILITY: The meet is open to anyone 18 and older. All entrants must be registered with U.S. Masters Swimming or a member of a FINA-recognized National governing body. Each swimmer is eligible to swim a maximum of six (6) individual events per day, excluding relays. AGE GROUPS: Swimmer's age is determined as of December 31, 2017. Age categories are 18-24, 25-29, etc. REGISTRATION: Online registration through Club Assistant. All individual entries MUST be received by 11:59 PM EDT on Friday, September 22. Swimmers may also register in person at any Runners Forum location. Individual entries completed in a Runners Forum store will receive $10 off the entry fee. All relay entries MUST be received by 11:59 PM EDT on Tuesday, September 26. For assistance completing the online registration process, please contact Karen Gernert at 317-340-1001 or kgernert@indyaquaticmasters.com. INDIVIDUAL ENTRIES: Entry fees are $40 for 1 day and $55 for 2 days (maximum of 6 individual events per day). There are NO DECK ENTRIES for individual events. Swimmers may also register in person at any Runners Forum location. Entries completed in a Runners Forum store will receive $10 off the entry fee. RELAY ENTRIES: Swimmers may only swim once in each of the following relays: 200 Medley, 400 Free, and 800 Free. For example, a woman may not swim in Event #1 (Mixed 200 Medley Relay) and Event #2 (Women's 200 Medley Relay). Relay age groups are determined by the adding together each swimmer’s age (72-99, 100-119, 120-159, 160-199, 200-239, 240-279, 280-319, 320-359, 360-399, etc.). Each of the four members of any relay team must be registered with the same Masters club. Once individual entries are closed, a list of team eligible swimmers will be sent to the designated team representative no later than Sunday, September 24. Relays are $10 per relay and fees are due at the time of relay registration (between September 22 - 26). Relay entries and fees (including team designation and age group) must be received by Tuesday, September 26 at 11:59 PM EDT. At meet check-in, relay cards will be distributed to the team representative. Relay swimmers may be updated onsite and changes must be turned in to the head table up to 30 minutes prior to the event. However, while swimmers may be updated, the age group may not be changed. Any relays that were paid for, but not swum, will receive a refund of their relay fees. EVENT DEADLINES: Individual entries close on Friday, September 22, at 11:59 PM EDT. Relay entries close on Tuesday, September 26 at 11:59 PM EDT. Relay changes must be turned in at least 30 minutes prior to the event. DISTANCE EVENTS: All distance events (400, 800, 1500 Free, & 400 IM) MUST list entry times. Competitors entering the 800 and 1500 Freestyle events must meet the 2017 LCM National Qualifying Time (including date and place achieved). The 800 Free and 1500 Free will be limited to the first 30 entries received meeting the NQT standard. The long distance events and 400 IM will be swum as mixed gender events, but scored by gender and age group. POSITIVE CHECK-IN: The 1500 (Sat.) and 800 (Sun.) require positive check-in (in person) before 7:45am on the day of the event and by 12:00 noon for the 400 IM (Sat.) and 400 (Sun.). Failure to check-in before the deadline will result in being scratched from that event. T-SHIRTS: With their entry, swimmers may pre-order & purchase a commemorative t-shirt for $15. T-shirts at the event will be $20. WARM-UP PROCEDURES: Swimmers must enter the pool feet first in a cautious and controlled manner. No diving or backstroke starts will be allowed, except in designated sprint lanes. One or two lanes shall be designated as one-way sprint lanes during the pre-meet warm-up sessions in the competition pools only. Any swimmer who acts in an unsporting or unsafe manner within the swimming venue may be considered for appropriate action or penalty by the referee (Rule 102.15.3). Pull-buoys, kick boards, fins, and hand paddles are not allowed in competition or warm-up pools. SCORING & AWARDS: Individual events: 9-7-6-5-4-3-2-1. Relays score double the individual event point value. Each participant will receive a commemorative card suitable for posting individual and relay results. QUESTIONS: For questions or additional information, please contact Karen Gernert at kgernert@indyaquaticmasters.com. additional warm-up period as the warm-up pool will be open throughout the distance races. Online Registration closed on 9/22/2017.